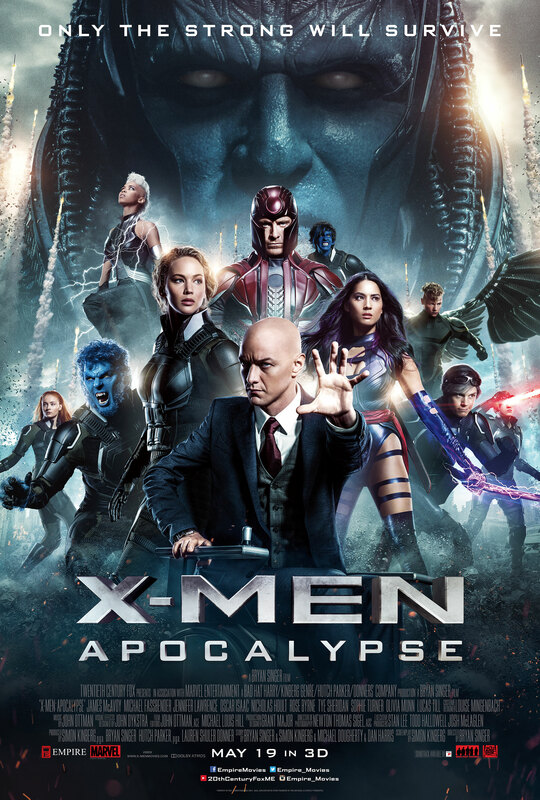 Synopsis: After awakening from a multiple millennium long sleep, the world’s first mutant En Sabur Nur otherwise known as Apocalypse finds himself in the 1980s and seeks to bring about human extinction, and Charles Xavier and the X Men must stop him. Review: Despite the nine films we have now had in this franchise, the events of 2014’s Days of Future Past scrambled those timelines for good and effectively erasing all the X Men films from existence, with the exception of 2011’s First Class. The reboot that set the wheels in motion for this new trilogy and the new direction that the franchise is heading. The first X Men trilogy certainly had after two great instalments, an ignominious third chapter is probably the reason the whole franchise got rebooted to get to where we are now. After two spectacular entries to the new trilogy, one could have hoped for that brilliant third chapter, yet sadly, the latest instalment once again falls short of matching the great quality of the films that came before it. This isn’t to say that Bryan Singer’s latest venture into the world of mutants is anything like the car crash that was The Last Stand, it certainly has its moments, but there are problems too. James McAvoy and Michael Fassbender having firmly established themselves in their roles as Professor X and Magneto bring very credible and powerful performances to the mix. For Magneto in particular when it looks as things are looking up for him in a new life, it isn’t long before it all goes very badly wrong. While she doesn’t give her strongest performance as Mystique, Jennifer Lawrence, also brings some solid acting to the mix. Without doubt one of the highlights of Days of Future Past was Quicksilver’s moment of brilliance. He has a similar scene here, and it is fun to watch him in action, but it’s nowhere near as glorious as his moment in Days of Future Past. Of the newcomers, by far the biggest stand-out is that of Sophie Turner’s young Jean Grey, a perfect casting choice as she gives off that vulnerability but extraordinary power that we saw from Famke Jensen in the first two X Men films, with her love interest Cyclops now played by Tye Sheridan. The two of them share a connection over their powers and it is exciting to see where this could go. Similarly Kodi Smit-McPhee gives an excellent performance as a young Nightcrawler. The script by Simon Kinberg does give each of these characters to flesh out their characters, but this isn’t applicable to every mutant. Yet when it comes to the villains, this is where the film REALLY loses its way. Oscar Isaac may have been an inspired choice to play the titular villain as he’s fast becoming a very prolific and great actor. Yet frustratingly, his performance while having its menacing moments, does feel somewhat underwhelming in a similar vein to Ultron in last years’s Avengers: Age of Ultron. This is supposedly the most powerful mutant to have ever existed and he is nowhere near as menacing as he could and perhaps should be. This frustration extends to his horseman, Storm, Psylocke, Angel and Magneto. With the exception of Magneto, their motivations are not entirely made clear and they are also given very little material to work with and flesh out their characters, unlike the younger mutants who are fighting for the X Men. The plot is a little bit disjointed and messy in terms of its pacing at times, and there is one side arc that arguably could have just been cut out of the film altogether, although it is quite possible that it was there to help set up a future X Men film down the line. The CGI remains of a decent standard and the action scenes in particular the final throw down are enjoying to watch, but they are nowhere near as enthralling as those that were helmed by Vaughn in First Class and by Singer himself in Days of Future Past. Thus ultimately this was a real missed opportunity for Singer to make a film worthy to its two predecessors and to cement itself as a great X Men trilogy. The film’s extensive cast all certainly give their all, but with so many characters all vying for screen time, some do get left in the shadows of the great Egyptian pyramid that Apocalypse emerged from. McAvoy and Fassbender bring the best performances, and a handful of new performances shine, but the underwhelming villain mean this doesn’t match the quality of Days of Future Past.